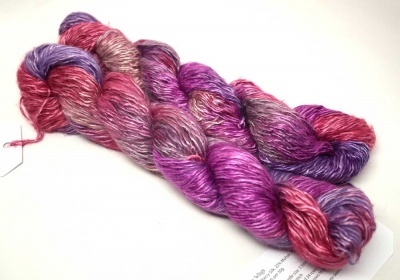 What we found is a new yarn for us, from a company called Fyberspates. 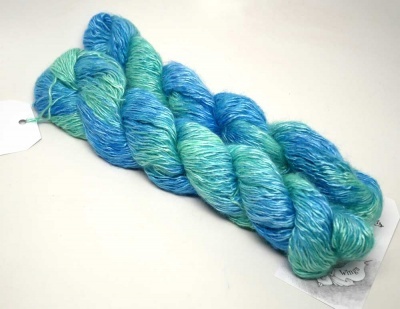 The yarn is Faery Wings and is made up of 69% mulberry silk/ 22% mohair/ 9% polymide with 191 yards (175m) per 50g skein. Despite the textured appearance of Faery Wings in the hank, the yarn knits up into a smooth and even fabric with luxurious drape and a soft halo. Lagoon is a cool mix of sea green and sea blue. Delicious. Peony is rich and lucious purples and wines, violets and strawberry. A flower garden. Just a thought --- you might like us to include some 6/0 beads, chosen to look good with the yarn you choose so you can dive right into whichever pattern you decide to knit these beauties in. So if you decide that yes, you'd like beads, we added an option via the drop-down menu above to get 20g of size 6/0 beads. That will give you about 240 beads. And if you have a preference color-wise, tell me. Otherwise I will choose for you.